Edit: The thread that the above link points to doesn't exist anymore. Using the name "DebianDog" (by me) caused so much trouble in general (and got me personally in such a stressful situation), that I finally gave up developing any further using that name. It's a complete rebuild from scratch using a minimal (netinstall) Debian Jessie as starting point. - Extended by adding more software/applications, e.g. python (required by e.g. youtube-get2, youtube-dl), ffmpeg (required by weX (screencast app by William (mcewanw), ffconvert and more). - Suspend should work now. (Note: works only when booted with 'Porteus style boot'). Thanks very much to forum members: saintless, mcewanw, sunburnt, sklimkin, rufwoof, backi, dancytron and others. Iso: DebianDog-Jessie-openbox_xfce-jwm-2016-10-16.iso Size: 255MB - kernel-3.16.0-4-686-pae. Default Internet Browser - Firefox-ESR. Load with Sfs-Load or (better) place in the 'live' folder (in case frugal install) and reboot. Beautiful morning, sun blaring, tell myself I am going outside, but first check the computer, and here is a new DebianDog - Jesse....in XFCE no less!!! So, the sun and outside will have to wait, lol. Thank you so much, Fred! For myself, your creations are the absolute best. I have only one request, possibly for future builds-----is there any way you can include the awesome "redhift" into DebianDog builds? I've been using it for a long time, and I finally got around to installing it in the older DebianDg64 of yours that still rules one of my machines. For an old man, with increasingly sensitive eyes, redshift is an incredible & very relieving thing. When I installed it (in the old DebianDog64), it works, but I had to jump through a lot of hoops and I still don't have a proper tint2rc taskbar icon because tint2 just doesn't want to play nice when adding .svg icons, which redshift has, 3 of them. I have to toggle between three wbar icons, and it is a best of a mess, lol....but, hey, it works. 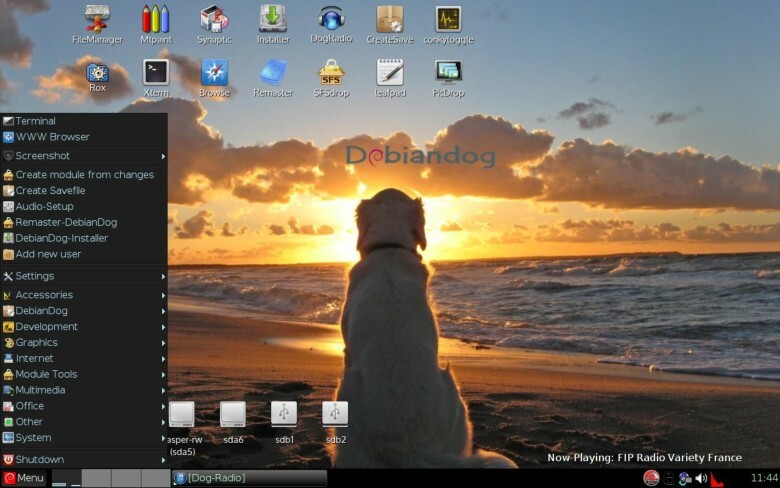 Thanks again for this new DebianDog w/ XFCE!!! Will post later today with feedback and a DE pic ....and I will----in my noob way----try to do anything to help the DebinaDogs stay alive & kicking. I will have a look at 'redshift', indeed it's nice, I've used it in the past. Hi fred and others ! You gave me some good reason to get out of bed . Frugal installed, ~2gb partition, with changes saved on 'exit' or 'reboot', on Athlon II X2 240 unlocked Regis, partition is on a 16gb sdhc card, Gallium AMD RS880 graphics, and basically everything is just great. Only things I did was immediately upgrade FF-ESR from your 24.8.1 to 26.0 (because I can't live w/o "https everywhere" add-on from EFF Foundation---sort of critical nowadays). Also installed 'ARandR' from Synaptic, to get my dual monitors working, also added the dual monitor script for startup purposes. Haha, I noticed one small thing that sure makes life a lot easier compared to old DD64 & XenialDog---you added a "Add/Remove User from Groups" to the menu. Hoooorrah Also, I added ufw via 'GUFW' from Synaptic. You might want to check, but GUFW does not show up anywhere in 'Menu" that I could find after installing ufw/gufw via Synaptic. But, for me, that's ok as I usually control UFW from terminal, and it shows there fine. Lastly, I cannot modify what's inside conky (in the '.conkyrc-live' and/or the '.conkyrc-port', otherwise, conky overall refuses to start, even from when I try to start in /etc/conky----figure I must be doing something wrong, but I've always did these conky mods before, even in the old DD64 & XenialDog, and they always worked & I never had a problem starting conky with the conkytoggle.sh). Here's a desktop pic (hope it shows, always have trouble posting pics to murga forum...usually I have to link from my photo pic site). Overall, great job...again! The DebianDog creations, along with mickos/peebees/phils/james&kirks creations, are the gold standards here on Murga! Installed D-D frugally to Usb -Flashstick with Grub4dos .Using an old Toshiba 3000 with 1 Gig of Ram . Htop shows 65 megs of Ram (from 1 gig total ). D-D Runs light as a feather and smooth as silk . 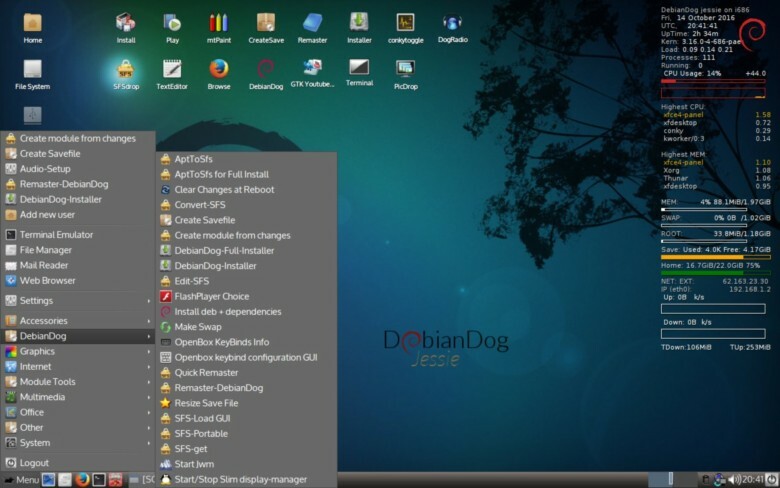 Deb-Dog is a real Treasure Trove .It`s a sort of Rolls Royce in Linux world . What else shall i say . As my Spiritual Master ALI G. used to say .......RESPECT !!! Now i will go fooling around a bit with my new Puppy Toy-Dog . Thanks a lot all you guys and .....see you later! That's only useful when logged in as regular user, aren't you logged in as root? Well, no it's for to drag and drop an existing SFS onto it, for example I have gimp.squashfs, when I drop it on to the icon a small application window appears, from which I can run Gimp (see attached screenshot) A SFS (.squashfs) can be created with "apt2sfs"
Similar for picdrop, drop a .png or .jpg onto it and you can convert to other format and/or change size (see screenshot) and will be saved in same folder as original. As for a popup when only click on it, I'll think about it, the app (by Terry (sunburnt)) is built with BACON, and I don't know anything about that. Strange, when I edit ~/.conkyrc-port (when booted using porteus-boot) and save the file conky restarts and I see the changes. But it didn't work properly on DebianDog so modified a little to handle utf-8, the script to run is "start-redshiftgui"
The first script rufwoof made was only for when changes=EXIT/.... has been used from boot command-line. I just installed it (frugal to hard drive). Installed lxterminal and ran quick remaster. Seems to work great. Almost too easy. The only thing I can see that I would change would be to also rename the save folder/file rather than give you a choice to delete it. That would make stepping back if there is a problem bullet proof. It was more along the lines for the family...especially the youngest, want to set one up without "root" ability, and she, when her friends are here. Also, thank you for explaining about SFSdrop and PicDrop. I really like the PicDrop as you describe, can't think of the number of times I run across pics and what to change their format. This will make is so easy. Thank you so much for the redshift work! Am downloading it right now and am going to play with it & get it working. P.S. Wanted to followup about the UFW/GUFW install using Synaptic. Even though it exists in /usr/share/applications, I cannot get GUFW to appear in the "Menu" and/or just right-clicking & trying to make a desktop link (when clicking on the .desktop file). It's really weird, because the icon is clearly there, plus it is in the pixmaps folder, plus the GUFW command works from terminal and/or if you just click on it in the /usr/share/applications folder. Yet the darn thing won't appear in "Menu" (even when I create a Menu item for it, but honestly I thought Synaptic install would do that). Plus, I cannot create it on the desktop nor in the XFCE bottom taskbar. Thanks again for everything! Will give you feedback on how I get on with the redshift stuff. Feedback redshift --- it works flawless, Fred! My eyes thank you very much!!! Sure ........would be a good idea !.....bullet proof is the way it should be . P.S. Wanted to followup about the UFW/GUFW install using Synaptic. Even though it exists in /usr/share/applications, I cannot get GUFW to appear in the "Menu" and/or just right-clicking & trying to make a desktop link (when clicking on the .desktop file). Open with leafpad, remove that line and "Firewall Configuration" will show in the Menu. Wow, I would never have caught that, as I sometimes think of Unity in the same vein as I think of the word "Linux". I know, I know, not good, but Unity is trying to silently take over the world, haha! Thanks again...GUFW is now in menu and on the desktop! Just a very brief run here so far, but absolutely fantastic and incredibly fast (default 1st, RAM boot)! Only real issue thus far is I can't seem to get the timezone sorted - "Setup Timezone" utility leaves me -4 hrs earlier than my true location (Eastern US, which is -4 GMT, or Eastern Daylight Time) i.e. - setting @ 0 hrs/Greenwich displays my proper time in the system tray and conky, but then the Xfce panel weather plugin displays 4 hours earlier, and thus won't update it's weather info (I imagine rejecting it as "out of date"). Otherwise booted quite fast from CD on this older dual-core Pentium Dell Optiplex 380 desktop, straight to the proper monitor resolution, Frisbee connected to WiFi thru a USB dongle, on-board sound works, Youtube vids play... and did I mention incredibly fast? Just great work, Fred!